The student pilot reported that, during a touch and go landing, they were about 5 to 10 ft left of runway centerline. The flight instructor told him to perform a go around and, during the climb, the airplane aerodynamically stalled. The instructor took the flight controls, the airplane drifted left, and impacted cars and "other ground objects." The flight instructor reported that, during the touch and go landings, she observed the student pilot was struggling to maintain traffic pattern altitude and was excessively left of runway centerline. She discussed with him that he would not be allowed to land until on centerline. During the accident landing, the student was left of runway centerline and she asked him to correct. He corrected and she anticipated a full landing. During the landing flare, the airplane drifted left and she instructed him to perform a go around. The student aggressively pitched up and she heard the stall warning horn and the stall audio annunciation. She took the flight controls and lowered the nose, but the airplane continued to drift left. The airplane impacted cars and a hangar. The airplane sustained substantial damage to the fuselage and left wing. The automated weather observation station located about 9 miles south of the accident airport reported that, about 5 minutes after the accident, the wind was from 290° at 9 knots, gusting to 15 knots. The student pilot landed the airplane on runway 34. 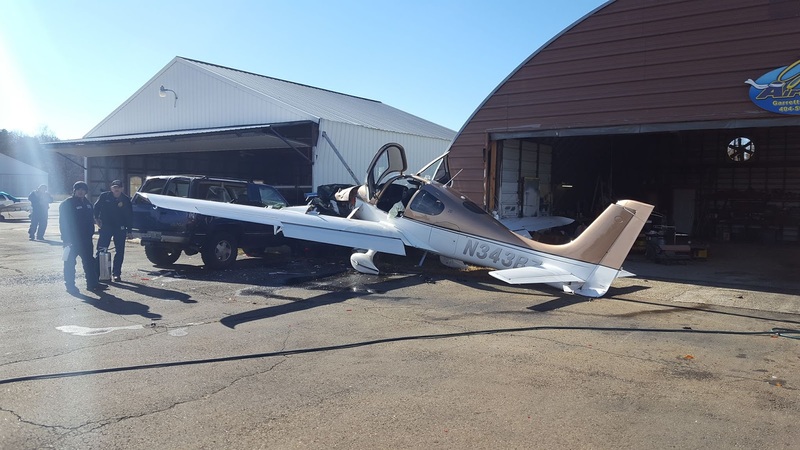 Jasper, Georgia – A small plane has collided with multiple vehicles at the Pickens County Airport on Wednesday, November 28th, causing minor injuries to two. Public Information Officer Kris Stancil of the Pickens County Sheriff’s Office stated that the National Transportation Safety Board would be conducting the interviews and investigations on why the crash occurred, but the Sheriff’s Office was called to assist with the incident. At this time, National Transportation Safety Board is taking over the investigation of this unusual incident. Cirrus 1,vehicles zero. Those Cirrus plane are tough. Could use one in the 5 o’clock traffic here! Two in the last 2 days right near me. This guy botched a landing, turned 90 degrees and came within 10 feet of my mechanic. The other one ran out of gas. The planes are probably fine. The bottom line on many of these is the successful guy had the money for the plane so he bought one. After all, how hard can it be? Aviddds where is the data that it ran out of gas. That is contrary to what the pilot stated to a few that knew him personally. Exactly! The pilot of the accident airplane settling to the ground under the brs parachute onto the Kennesaw College campus said he observed sparks from under the engine cowling followed by a loss of engine power -- he didn't run out of gas!